As folks here on Earth prepare to mark thepassage of another year, two NASA robots a world away are creeping up on a bigmilestone of their own: seven years on the surface of Mars. The golf-cart-size rover Spirit landed onMars on Jan. 4, 2004. Its twin, Opportunity, hit the planet's red dirt threeweeks later, on Jan. 25. The rovers were originally supposed to tool around theMartian surface for a mere 90 days, looking for evidence of the planet's pastwater activity, but both have far outlasted their warranties. 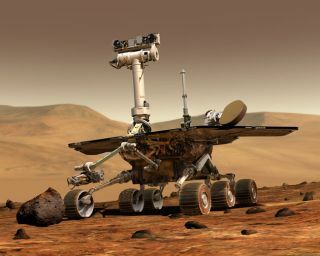 In 2009, however, Spirit got trapped in softsand and in March 2010, the rover stopped communicating with Earth. Still,mission scientists think the intrepid rover may wake up in the next few months.Meanwhile, Opportunity is still going strong, making its slow, steady waytoward a hugecrater called Endeavour. And, on a more abstract level, the rovershave brought Mars closer than ever before, making another world accessible toscientists and laypeople alike. "In addition to all the scientificdiscoveries, these rovers have made Mars a familiar place," John Callas,Mars Exploration Rover (MER) project manager at NASA's Jet PropulsionLaboratory in Pasadena, Calif., told SPACE.com. "Mars is now ourneighborhood." Beginning with NASA's Mariner 9 spacecraft inthe 1970s, multiple orbiters have detected evidence that liquid water onceflowed on the Martian surface. Spirit and Opportunity were sent to investigatethese clues, to look for more, and to put everything into a better geologicalcontext, researchers said. "We were sent there under the paradigm,'Follow the water,' to find the evidence for wet conditions," MER deputyprincipal investigator Ray Arvidson, of Washington University in St. Louis,told SPACE.com. "And we've done that." Most of that evidence points to a wetter Marsbillions of years ago. But some of Spirit's recent discoveries ? made after therover got trapped in soft sand in 2009 ? suggest that liquid water may havetrickled across the Martian surface much more recently, perhaps just hundredsof thousands of years ago. Spirit's right front wheel stopped working in2006, impelling mission scientists to drive the rover backward instead. Therover probably would not have gotten stuck in the sand ? where it remains today? if all six wheels had been working properly, Callas said. But the wonky wheel proved something of ablessing. It dug a shallow trench through the Martian soil as Spirit chuggedalong. In 2007, one of Spirit's drag-furrows exposed subsurface deposits ofpure silica, which forms when hot water reacts with rocks. Spirit thus unearthed compelling evidence of hydrothermalsystems on Mars, perhaps similar to the geysers of Yellowstone NationalPark, located primarily in the U.S. state of Wyoming, with sections that extendinto Montana and Idaho. The find was intriguing, suggesting that large amountsof energy ?possibly life-sustaining energy ? once coursed through some Martianenvironments. "Not only was there liquid water onMars, but there were energy sources coincident with that liquid water,"Callas said. "So you have a system that could potentially support anecosystem." Spirit and Opportunity were each designed tolast about three months on the Martian surface, and to travel about 0.6 miles(1 kilometer). Spirit lasted more than six years, and could still wake up. Todate, it has put about 4.8 miles (7.7 km) on its odometer, NASA officials said. Opportunity has been roving for almost sevenyears now, covering about 16.5 miles (26.5 km) as of late December, scientistshave said. "You get what you pay for,"Arvidson said. "They're just well-made American vehicles that have beenthoroughly tested before launch." Arvidson said that part of the rovers' legacywill be their tremendous longevity and the solid engineering that producedthem, which should be instructive for future rover missions. "In terms of engineeringaccomplishments, we've set the bar so high," he said. "These vehiclesare so far out of warranty, and they've traveled so far." The rovers are also testing and working toadvance technologies for future rover missions, including NASA's MarsScience Laboratory (MSL) ? also known as Curiosity ? which is scheduled tohit the red dirt in August 2012. Curiosity's baseline flight software, forexample, was tested first on Spirit and Opportunity, Callas said. Missionscientists also recently loaded Opportunity with software called Aegis, whichallows the rover to sift through its own images, find interesting targets andtake follow-up pictures, autonomous from the rover team back on Earth. "That software is going to be baselinefor MSL as well," Callas said. The crippled, trapped Spiritwent silent on March 22, 2010, after failing to maneuver into a positionthat would slant its solar panels toward the sun over the course of the Martianwinter. But now spring has arrived on Mars, and the rover team is holding outhope that Spirit will warm up, wake up and check in. "We're listening now," Callas said. "We've been listening every day." If Spirit does bounce back, it can continueto make valuable observations even while bogged down in the dirt, scientistssaid. For example, researchers hope to track theradio signal from a stationary Spirit, using the rover's movement as a proxyfor the rotation of Mars, Callas said. Scientists could thus get very precisemeasurements of the planet's rotation, which could help them figure out how bigMars' core is ? and perhaps reveal other important details. "If we see a slosh, we can tell whetherit's a solid or a liquid core, and that would be a really, really key findingfor Mars," Callas said. Of course, there is no guarantee that Spiritwill wake up. The Martian sun will be at its strongest in March 2011, so if therover has not risen from its slumber by then, the team's optimism will likelywane. "That would be a bad sign,"Arvidson said. Despite continuing to boldly trek across thesurface of Mars, Opportunity is showing some signs of its advanced age. Itsrobotic arm is arthritic in one joint, Callas said, though the other fourjoints are still working well. And in the summer of 2008, the gearbox in therover's right front wheel experienced a spike in electrical current, similar toone that preceded the malfunction of Spirit's wheel. While Opportunity was not crippled,scientists have been driving the rover backward for more than two years, Callassaid, to distribute the wear more evenly amongst the rover's gear mechanisms. Yet despite these hiccups, the rover keepschugging along, and most of its instruments are still in remarkably goodcondition, as are those on Spirit. "Our cameras are in excellentshape," Callas said. "The rovers still have 20/20 vision allaround." So, will Opportunity make it to Endeavour,which is about 3.7 miles (6 km) away at this point? How much longer will therover tool around the Red Planet's frigid, bone-dry surface? It's anybody's guess, Callas and Arvidsonsaid. But the rover has turned a 90-day mission into a seven-year marathon, soit's probably wise not to bet against it ? or to count Spirit out. "I think there's still quite a bit ofadventure left for these rovers," Callas said.